Pilates is a unique series of controlled, flowing movements that will give you a leaner, sculpted body, improve your posture and increase your abdominal and lower back strength. Our pilates classes will not only improve your shape but will also promote flexibility and help remedy any postural problems you may have by realigning your body structure to its natural balance. The exercises are progressive and become more complex and challenging as the client advances. In Mat Pilates you're performing the exercises while using your own body weight for resistance. You will learn how to engage your "core" to become the powerhouse of all movements. By adding props such as thera-bands, balls and the pilates ring you can double or triple the diversity and intensity of moves for a mat class! The reformer uses springs, pulleys, bars and straps to perform the exercises in various positions. 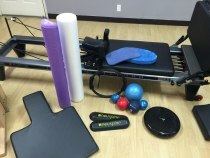 The equipment was originally developed to bring movement and rehab to the injured. 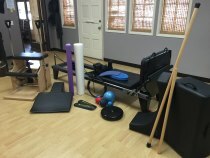 At Brown Chiropractic we still use the equipment in this fashion when we are working with someone who has disabilities or limitations. The reformer can also be a great tool to add resistance and increase the challenge for the more seasoned pilates client. Some of our group reformer classes will also include the use of props, the "Tower of Power" (1/2 trap) and the jumpboard to take your workout to the next level! We use the Allegro Reformer by Balanced Body. Reformer classes are limited to 6 people max. If you've never done a reformer class you must have a private session(s) before joining a group class.